Despite teething problems and a prolonged legislative process, paperless navigation is becoming the new reality at sea. Latincomp es representante de Sevencs GMBH, compañía alemana de software de navegación. Su sistema Ceact, especialmente diseñado para navegación fluvial, ha probado ser el que mejor se adapta a las necesidades de las hidrovías latinoamericanas. Combina las herramientas de navegación más poderosas con una interfaz simple e intuitiva, y está completamente traducido al español. Es el sistema preferido y más utilizado hoy por los capitanes de convoys de empuje de la Hidrovía Paraná Paraguay. Si desea obtener una instalación de prueba. The new 5.18 version of the EC 2007 software development kit (SDK) from SevenCs is available for both Windows and Linux applications, updated to now include support of Digital Terrain Elevation Data (DTED), ARINC 424 Aviation Charts and new development environment Visual Studio 2010 32/64bit. The EC2007 ECDIS Kernel assists OEMs to develop a wide range of marine chart display application, such as ECDIS, WECDIS, VTS, Inland ECDIS, ECS, PPU and tactical consoles. 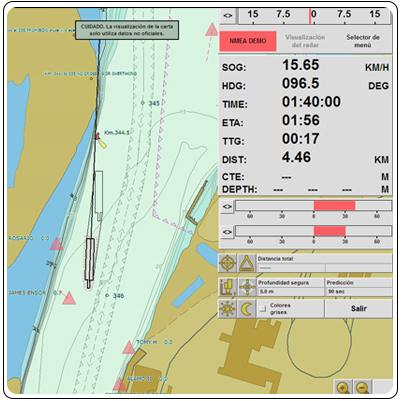 It includes more than 1,000 functions for chart display, chart handling and navigation. Its use reduces product development costs and risks and facilitates the effort associated with keeping up-to-date with complex chart display standards. Björn Röhlich, Sales Director of SevenCs commented, "The new aviation module allows our clients to fulfill the operational and tactical requirements of the navies worldwide. Joint operations between air force, army and navy require a detailed chart presentation to allow an optimum allocation of forces and situational awareness."